An exciting new way to explore music... or expensive, unnecessary software? Over the last year or so many articles have been written that include something like “Roon Ready” or “Roon compatible” If you are a new or even an experienced audiophile you may be wondering what that actually means. Put simply, ‘Roon Ready’ means the DAC or other device being certified complies with all Roon Labs requirements to fully allow for all Roon’s considerable functionality. That invites a deeper question of course – what is Roon? Roon is a software component for your digital audio system designed by Roon Labs. We buy amps, DACs, and speakers to put together our rig. Roon should be looked at as one more part of that system. Roon puts a digital front-end on your entire music collection no matter where in your system it may be stored, and allows you to source your listening from your computer or via a tablet to one or multiple output devices located throughout your home. Its peerless music curation function allows you to have your own favourite and personalised radio station made up of Roon selected tracks based on as little as one song selected by you to begin your listening session. More on that later. For example, many of us have music files from iTunes on our Mac or PC. We may have downloaded purchased hi-res files from HD Tracks. We may also have an extensive library of CD ripped files as we have begun to store away our physical libraries. In many cases, mine for example, those files can be spread over many storage devices. Roon seeks them out across your home network upon install and integrates them seamlessly within Roon’s media management front end. OK, you say, I have other software that can do that, so what? Roon also provides an extensive library of Metadata to sort and categorise your files. You can add to it manually too to further customise your collection. Other software can do this as well you say? Roon also licences extensive artist information to further flesh out your collection. In fact, Roon will continue to review and add liner notes, photos, and additional versions of music as it manages your collection. I don’t know anything else that is so proactive with my library. 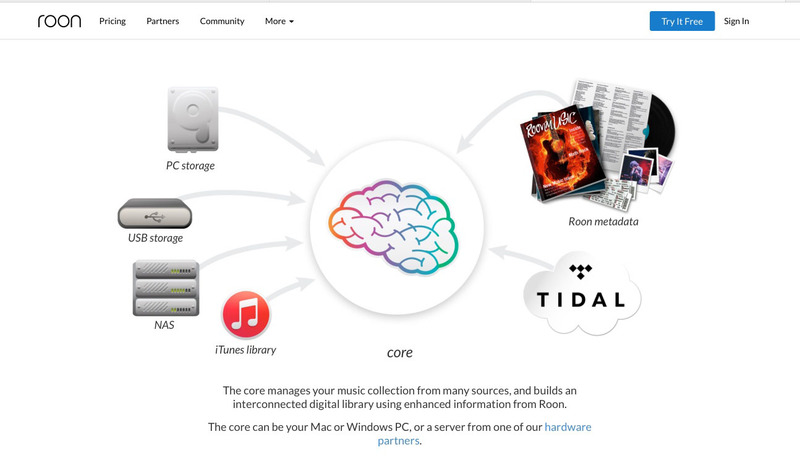 Roon also integrates with TIDAL allowing an extraordinary expansion of songs, albums, and versions to your collection. It can output via Airplay or to a Bluetooth device or both simultaneously. You can select a variety of different output devices in your home and tie them together for multi room output. Pass the iPad around to everyone at the party and let the playlist construction begin. The variety of functions is an integral part of why Roon was created in the first place. It’s designers (the brains behind Sooloos) envisioned a way to bring a more active and engaging aesthetic to the listening experience. I certainly have found it to be very engaging. My first day with Roon I entered a search for a guilty pleasure, The Eagles ‘Hotel California’. I know… What a cliché`! Whatever, I love the song and the album. No apologies. However, once the song was over the next song up was Fleetwood Mac’s ‘Rhiannon’. Another old favorite, then Jackson Brown followed and so on, for hours. A single song selection led to my own personal 1970’s soft rock station! It turns out this automated station-building is a central aspect of the Roon design ethos: freedom from the tyranny of choice! I know I have had many days when I have stared at my library of nearly 40,000 songs and could not make up my mind what I should listen to next. The Roon designers had the same experience prior to creating Roon. Their integrated curation function is extraordinary in offering up choice music that I had not initially considered or was not aware of. This is a great boon for the classical music buff with so many great artists, orchestras, and conductors who have recorded the same composer, but each presenting it in their own way. Perhaps you are an old audio dog like me and want to get a sense of newer genre’s. Ask your kids for a favorite artist and play a song they like and then let Roon expand your musical horizons. Occasionally a song will pop up that is just not your thing. That is what the forward button is for. Another aspect of the engagement I have touched on somewhat is the more active information around the songs and artists that you find in a typical music management software. iTunes and other music organization software offers up a two-dimensional spreadsheet look to your song choices. You can view in album mode but either way it is a static seeming presentation. Roon offers up the full “Hold the album in your hands” experience, including music reviews by industry professionals. This is an aspect of the actively managed metadata and data sets licensed by the Roon team. They want to provide that sense of ownership without the storage space. I have enjoyed many afternoons with Roon, discovering more about a band than I had known before because of these liner notes and reviews. They are well written and researched adding a nice dimension to the otherwise music only delivery of digital.